In the post-Fukushima era, one of the first steps of Nuclear Transparency Watch (NTW) was to establish a working group on Emergency Preparedness and Response (EP&R), which has conducted a one-year investigation of off-site EP&R. This report has been presented today in the European Parliament in the presence of Klaus Buchner, Ana Gomes, Jo Leinen, Michèle Rivasi and Julie Ward. An independent expertise – Whereas the industry is well organized at the European level, this EP&R report aims to give a different point of view from the civil society and to contribute in increasing the quality of decision -making on safety. “Civil society has a high valuable expertise which should be taken into account for off-site management of nuclear emergency and post-emergency, which have not been taken on board of the European nuclear stress tests. 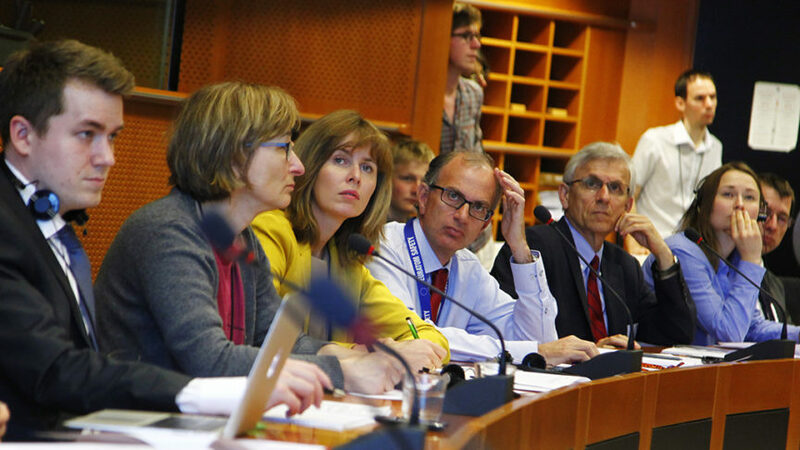 Furthermore, citizens and citizens’ organisations should be the principal partners in EP&R plans since they are the ones who are affected in a nuclear event.” said Nadja Železnik, chair of EP&R WG from NTW and director of Regional Environmental Center – Slovenia. Europe didn’t take into account lessons from Fukushima – The NTW report presents a review of EP&R provisions, in the perspective of the main challenges identified in the management of the Fukushima emergency. “The disaster of Fukushima has shed light on a number of very serious dysfunctions: in one of the evacuated city, Futaba, patients of the hospital have been left on their own for three days because the medical staff had run away. The panic made all plans useless, despite the famous “Japanese discipline”. Besides the unforeseeable reactions (which will lead in any way to chaos), the theoretical plans revealed totally inefficient. There are numerous shocking facts. Some patients were transported to places without any care facilities and the evacuation zone was ill defined and too small (it jumped arbitrarily from 2km to 3km and then to 10 and 20km, whereas the US authorities ordered their expats to leave from the 80km zone). Today, cities all over the world have dwelled and get denser in a way which is not taken into account and poses unsolvable problems”, said Michèle Rivasi, chair of NTW and Member of the European Parliament. European challenges for EP&R – The heterogeneity of measures in different countries (like the distribution of iodine tablets, evacuation perimeters and zoning) is a crucial transboundary dimension. Vigilance on nuclear safety will remain a key European issue in the future that transcends borders whatever Member states choices will be made on the energy mix. “There are no borders for nuclear accidents. We should work together on EP&R, whether we are pro or anti-nuclear!”, added Albena Simeonova, member of NTW and Foundation for Environmental Center – Bulgaria. NTW urges the European Parliament, the European Commission, national governments, regional bodies and municipalities, together with nuclear operators, to provide access to relevant information and to support participation of interested citizens and civil society organisations in the development of better provisions and systematic transboundary arrangements.